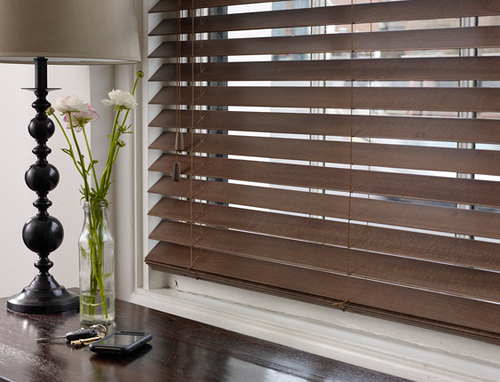 How can wooden blinds make your home more eco-friendly? Why should you make your house eco-friendly, well not only will you help to combat global warming but you will also to save costs as fuel becomes increasingly expensive? There are lots of things you can do to help green your home, from the obvious steps such improving your insulation to more obscure ones such as fitting wooden blinds. At first glance, this may seem somewhat weird but with both of these steps, the same principle applies. By blocking and directing natural heat and light you can use less energy heating, cooling and light your house. By blocking windows blinds plug huge these gaps in your insulation and they do so in a way that gives you much greater control over how much light and heat gets in than the alternatives. For example, say it’s a hot summer day and you are working in your study which is equipped with Venetian blinds. By opening the slats you can let light in without suffering the glare that drawing the blind would cause. Later in the day when the heat and sunlight get a little less intense, you can draw the blinds to let more in, before closing it fully in the evening to prevent heat escaping and stopping anyone from looking in. This means that there is far less of a demand put on more expensive and less eco-friendly measures to control your houses temperatures such as air con and central heating. Wooden blinds are probably the most eco-friendly option because wood sourced from sustainable sources, such as those tends to have far less of an impact than equivalent amounts of plastic or metal. Not only is it far less destructive to extract, but it also takes far less energy to manufacture wooden products. The process of making wooden goods also produces far less toxic by-products than either aluminum or plastic. In addition, the process of growing trees captures carbon dioxide which is then locked into the products produced from these trees. Wood is also a renewable resource. Whilst metallic ores and oil are reduced by our use, well-managed forests replace the wood that is taken from them. They also provide huge ecological benefits by providing biodiverse habitats as well as oxygen, clean water, and even new medicines. Of course, this means that it is important to only use products from manufacturers who can guarantee their wood comes from approved sources. Unmanaged and illegal logging is incredibly destructive both to the environment and indigenous populations. The best wooden products come from local forests and manufacture which reduces the carbon footprint caused by transporting the goods. Make your interior stand out with unique fittings by installing wooden blinds.